Give the HR Department something they need, give them access to Keynote's Employee services. Our software is tightly integrated, giving you the peace of mind you need. For more information about our software, click here. Our clients spoke and the long awaited Keynote Employee Services are ready for launch at your branch. We've designed it be aesthetically pleasing and easy to use but best of all its as reliable and fast as all of our software. Give the employee's the ability to update their information, access Direct Deposit slips online, check their schedule, and if you need more we are ready to expand this product. Built from the ground up to give employee's quick access to their information while giving administration complete control. All you need to activate this service is to be using our payroll service, and a internet connection. We give you the ability for custom branding that's included in the price, and we are sure you'll enjoy just how much a difference having this application around. Give your HR department something they need, give them access to the Keynote Employee Services so they don't have to make the small changes and to ensure your employee data is up to date. Let your employee's take control. We offer many methods of enrollment, including self enrollment. An employee doesn't need HR to set them up with an account, all they need is an e-mail address, a pay-stub (or Direct Deposit slip), and their social security number. They just log in, click enroll, and in less than a minute they are enrolled and ready to get to their schedules, wage information, update important employee information, and much more. 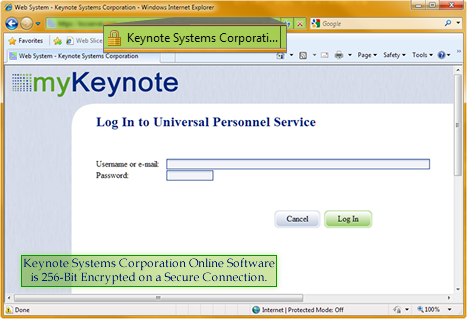 Our Keynote Systems Corporation Employee Servers are secured and protected, they even go as far to inform the employee that this site follows a web security standard, as pictured above. With unlimited potential, how can you pass up on an opportunity to increase productivity while preventing misinformation. Don't wait, call Keynote Systems Corporation today! We can save you up to 30% on payroll and still provide this service to you at affordable rates, call (716) 564 1332.